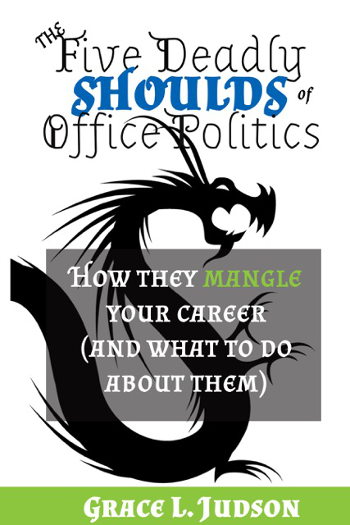 Starting with a surprising re-definition of what office politics really means, this slim volume contains a wealth of practical, accessible information about how to recognize and overcome the five most career-damaging beliefs and behaviors about politics in the workplace. Whether you’re just starting out or you have years of experience and leadership under your belt, the key take-aways from this book will help you achieve career success without feeling as if you’ve given away your integrity by “playing” politics at your office. Case studies and hands-on exercises (so you can practice your new skills immediately) round out a book that’s sure to become a standard reference for anyone looking to succeed with integrity. I have been reading The Five Deadly Shoulds of Office Politics from cover to cover for the past few hours. It is fantastic and so very relevant to my life at this particular juncture. Many thanks for sharing your insights on your Web site and in your newsletters – now I know that I am not crazy. Your perspective has helped me see that I fall into the category of being unwilling to compromise my integrity and “play the game.” I know I have always been willing (and preferred) to deal with the negative consequences that result from that decision rather than drink the Kool-Aid. Reading The Five Deadly Shoulds has helped me understand the third option that I had never considered, and has provided me an opportunity for another turning point. I am already a leader, I bring a unique skillset, AND I have a LOT of experience with TERRIBLE supervisors – so surely I can do better! Your book has helped me see that I don’t have to drink the Kool-Aid, and that I have a responsibility to use what I know to help others succeed. If I don’t, then I will be letting myself down and and hurting myself simply because I am unwilling to move outside of my comfort zone.